The DeathAdder is a bit bigger than the EC2 so a lot of this comparison will boil down to grip type and size preferences, both shapes are good and perform well. I like the EC2 buttons better than the mushier DeathAdders, both have similar stiffness in their cables. Both mice pack perfect sensors. 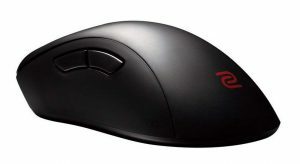 I would overall give the EC2 a slight edge for most people, the shape and size are going to be suitable to a bigger audience than the Deathadder Elite.